It was like a Christmas present in need of a bow. We had developed a new arrangement for this holiday season. 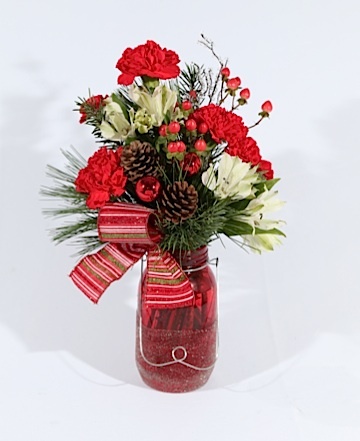 It would come in a red mason jar and include red carnations, white alstroemeria, hypericum, tips of Douglas fir and white pine, pinecones, and shiny red stick-ins. The only ingredient missing was a name. But that has been taken care of, too, thanks to more than 450 entries in our online name-the-arrangement contest. Three people submitted the winning name, and as their prize they will receive one of the arrangements in early December when it becomes available to the public. The winners are Lori Heisey of Columbia; Katharine Hoch of Hummelstown; and Diana Myers of York.